I am sitting here at 11 o’clock at night, having a little glass of wine & eating as much cheese as I can find. I just went to the grocery store & I still feel like the only thing I have in the house is cheese, salad, & Captain Crunch cereal. I mean, I’m not complaining, I’m just making a statement. I’ve been trying to be good the past few months & not binge eat a block of cheese in one sitting, because trust me, it’s one of my biggest weaknesses. So now if I need cheese for a recipe I find the smallest block of cheese, or find ways to use it up so it isn’t staring at me every time I open the drawer telling me to eat the entire block. But then I found these single serving pre-wrapped goat cheese discs from Trader Joes & I mean is there anything better in the world? No, the answer is no. In my defense I am eating a few berries also! See healthy! Today for lunch I stuck on the same cheese path, maybe that was my gateway drug. I pulled out a lasagna that I made a few weeks ago from the freezer because I knew I wouldn’t have time to cook dinner tonight since I was closing the store. So I left some home for Chris & I took a portion to work to eat during my lunch break. 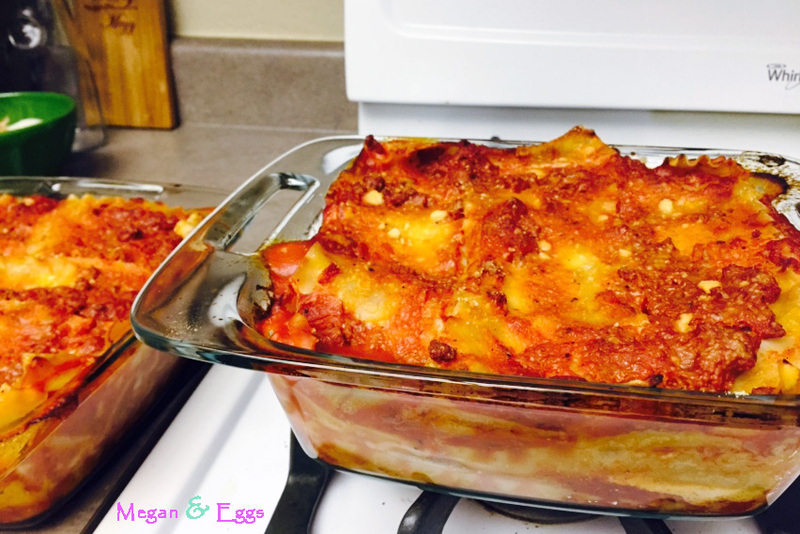 Try it out, the best part about any lasagna, you can freeze it! Any if you have been around this blog a time or two, you know I love anything you can freeze & eat later. Because there is just two of us at home, I usually make a full lasagna but break it into two 9×9 pans instead of a 9×13. It’s a little fatter but we don’t end up wasting the majority of it, which is always nice. You can make it whichever way works better for your family. Enjoy! 1. Salt and oil pasta water. Cook pasta to directions on box. When pasta is cooked, drain and separate noodles so they do not stick together. ** I lay them over the side of the pasta strainer and pot that I cooked them in. 2. Brown beef in frying pan. When done, use a slotted spoon to remove the beef from the grease. Place on a dish lined with a paper towel. 3. Heat olive oil in a deep sauce pan. Sautee onions for a minute or two and then add garlic and sauté for another couple of minutes. Add tomatoes. 4. Add meat, basil, parsley, salt and pepper and allow to cook 30 minutes. 5. While sauce is cooking mix an egg into the ricotta cheese. Mix well so ricotta is fluffy and smooth. 6. 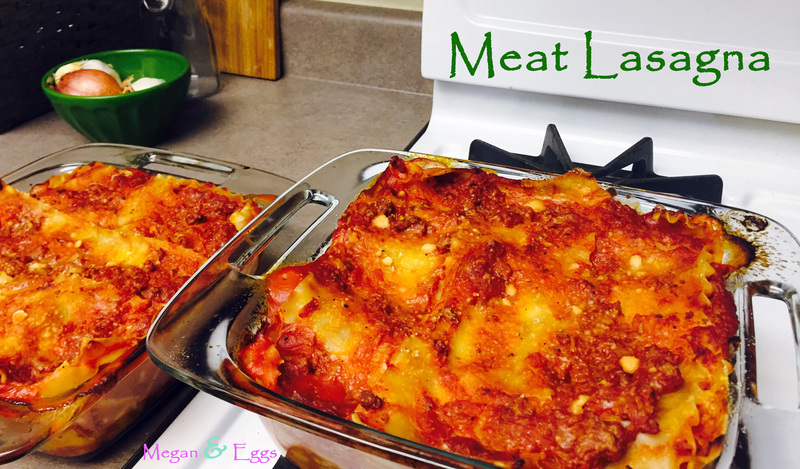 Add salt and pepper and set aside until ready to assemble lasagna. 7. Cut mozzarella into 1 inch cubes. 8. When sauce is cooked, remove from heat and add the first layer of sauce to a 9×13 baking dish. 9. Place noodles down to cover the entire bottom of the dish. Top with ricotta cheese mixture and sprinkle mozzarella throughout. Add sauce on top and top with a noodle. 10. Repeat until there is about ½ inch to the top of the baking dish. The last layers should be noodle, sauce, and sprinkle the top with grated parmesan cheese.